The Garden of France with exceptional agricultural history, if you are looking for a property for sale in the Lot et Garonne have a look at our exceptional selection below. Unique, in a dominant position with a magnificent view over the countryside, beautiful 16th century farmhouse, entirely renovated with an attached gite, a pool and double garage. Stunning private property in a "U" shape, entirely renovated, set in approximately 9 hectares of parkland. Boasting panoramic views, it stands out with elegance in a green and magical setting. Estate on the banks of the river Lot, including a large manor house with luxury Bed et Breakfast rooms, a gite, a barn and a pool set in just under 8 hectares of land! This property will seduce you by its tranquility and beauty of its environment. Striking stone house, separate Gite, swimming pool, lake and stables with outstanding views over the Castle Biron. This charming Manoir is set in an elevated position with views overlooking the Dropt valley and across to the hilltop village of Monteton. The property has been lovingly restored. Stunning villa ideally located on the heights of Agen, on a no through road with breathtaking 360 degree views, close to public transport and shops. This villa offers light filled rooms and balconies. This stone Maison de maitre was once a village school dating back to the 1800's. The property and its garden have walls dating back to the Ramparts. This stunning architecturally designed property offers over 193m² of internal living space and 81m² of external covered terraced living areas. This architecturally designed stone Barn Conversion has been renovated with the highest quality materials and exceptional style. Situated down a quiet country lane, in a sweet hamlet, is this beautiful six bedroom stone property which has been exquisitely renovated by the current owners. Surrounded by 4 hectares of rolling countryside yet within a short walk to its 13th century village, this sweet property in need of redecoration and part renovation holds a fabulous opportunity for a variety of purchasers. This spacious character filled house has four bedrooms, a swimming pool and double garage, situated in a beautiful park of over 3500m². Beautiful riverside property set in 2 hectares of landscaped gardens, within close proximity to all amenities and offering great potential for a BetB or gite activity. Close to Penne-d'Agenais, in a country setting with beautiful views. This stone property has been renovated to a high standard and is set within it's 2 hectares of land. Ideal for nature lovers, this is a must see! 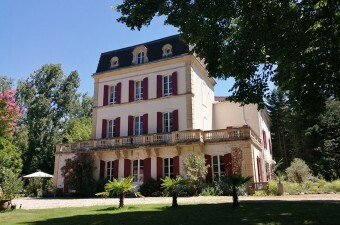 Excellent price for this Maison de maitre set in 1.4 hectares of gardens and woodland. It offers three double bedrooms, and two bathrooms and is in very good condition.